Thanks for your interest in our garbage compactor. YTO Group Corporation is the manufacturer of this compression garbage truck, and it has been in agriculture machinery, construction machinery and special vehicle industry for over 50 years. YTO produces its products according to ISO9001:2008 quality management system and ISO14001 environmental management system standards. So, we can offer quality products in an environmental friendly manner. 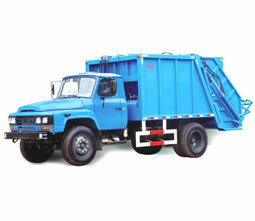 This page is focus on our compression garbage truck, and the following will describe for you some details. (1) This garbage truck is designed with fully sealed structure and a device to prevent sewage leaking, thus avoiding secondary pollution. (2) Due to the combination control of hydraulic, electrical and pneumatic elements, our garbage compactor features high automation and simple and safe operation. (3) Garbage loading, compression and unloading are all finished by a hydraulic system. (4) This truck is equipped with an automatic sprayer and independent vehicle-washing system, thus helping keep truck clean at all times and improving working condition. (5) YTO garbage truck is characterized by large wastes compression ratio and high working efficiency. It is suitable for carrying various household wastes. (6) It can be optionally equipped with garbage bins to broaden its application range. (1) This garbage compactor is designed with a unique structure, as the picture shows. (2) Fully sealed structure and sewage collector prevents secondary pollution effectively. (3) As a result of the combination control of hydraulic, electric and pneumatic elements, this compression garbage truck feature high automation and simple and safe operation. (4) Garbage loading, compression and dumping are all completed by a hydraulic system automatically. (5) The same with LT5208ZYS, this vehicle also comes with an automatic sprayer and independent vehicle-washing system. (6) Optional accessories like garbage bins are available to maximize the applicable scope of our compression garbage truck. (7) Air conditioner, rear-view devices and a motor-driven hydraulic system is optional. In addition to garbage compactors, we at YTO can also produce crawler tractor, road roller, heavy vehicles, and diesel engines. If you have any need on our products, please feel free to give us a call or send us an email.